Can you hear those sleigh bells jingling? Yes, Queanbeyan Christmas in July is back with all the delights of a mid-year Christmas gathering. Enjoy over 200 unique market stalls, belly filling foods and a whole lot of community love. The day includes Christmas-inspired food, gourmet treats, beer and wine, handmade Christmas gifts, an artificial snow area, Daschund races and fashion show, an art exhibition, a play area for your elves, carriage rides, outdoor obstacle course, bubble soccer, Santa pet photos and a giving tree. There is even a special appearance from Santa from the South Pole. This year the QPRC Events team worked hard to be even more merry. So while Mariah Carey might not wish for snow…. they do and this year a winter wonderland will be created with artificial snow and even more Christmas merriment. From Christmas cookies to mulled wine to dogs dressed as presents, the day includes all things merry and bright. 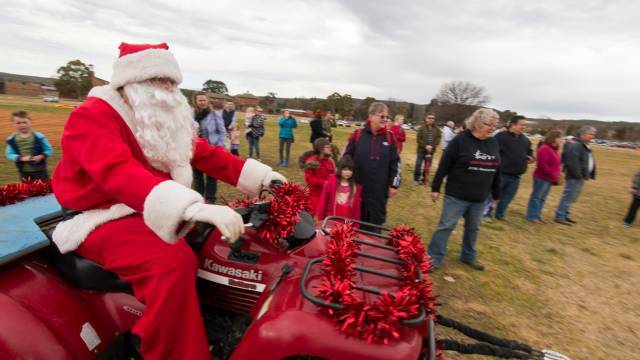 Your junior elves will be well looked after thanks to the Queanbeyan Show Society who will be bringing a taste of the show plus a chance to make your own Santa sack.